Chlorantraniliprole and novaluron, two reduced-risk insecticides (IRRs), are currently used to control codling moth (Cydia pomonella) in apple orchards in southeastern Canada. Reproduction of Harmonia axyridis (Pallas), an invasive ladybeetle, and the indigenous Coleomegilla maculata DeGeer, both important generalist predators, might be compromised after exposure of adults to these IRRs. 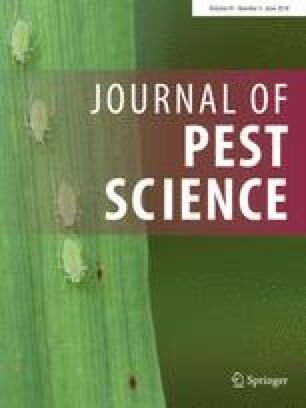 The aim of the study was to compare the effects of chlorantraniliprole and novaluron on fecundity and fertility between the two ladybeetles in a laboratory setting. Reproductive mates were given chlorantraniliprole- or novaluron-treated prey for 24 h, and reproductive performance was followed during 15 days. Chlorantraniliprole did not affect reproduction of ladybeetles. However, novaluron-reduced fecundity, egg hatch, and fertility of the invasive ladybeetle H. axyridis, by 29, 43, and 78.7%, respectively, contrasting with no significant effect on the indigenous C. maculata. Additionally, H. axyridis oviposition pattern was altered by the same insecticide. This resulted in more egg masses containing fewer eggs, compared to the control. No such changes were detected for C. maculata. Chlorantraniliprole does not disturb reproduction of H. axyridis or C. maculata. Treatments of novaluron should have an important effect on populations of the invasive H. axyridis, and consequently on the impact of the invader on native ladybeetle species and on its dominance, and finally potentially on biocontrol services provided by the assemblage of ladybeetles. Funding of this project was provided by the regional industry council of Quebec, executing the Canadian Agricultural Adaptation Program for Agriculture and Agri-Food Canada, the Program Prime-Vert from the Ministry of Agriculture, Fisheries and Food from Quebec, the Natural Sciences and Engineering Research Council of Canada (NSERC), and Canada Foundation for innovation (CFI). We also want to thank Jill Vandermeerschen for her advice with statistical analyses, Marc Fournier for his technical support in the laboratory, Franz Vanoosthuyse for the technical support, and all the students for assisting with the ladybeetle rearings and for helping us to take data during long hours in the laboratory.